When I placed an order for some French style candlesticks back in early January I didn't expect them to take long getting here since they were in stock. After realizing three weeks later that I had never received them I contacted the company I ordered them from. I found out that because I live in Georgia and the on line site that I ordered these from was in Georgia, too that the vendor, Aidan Gray, was having issues selling these to someone in the same state. Something about resale and the site I ordered these from was trying to get this issue straightened out. Well, I don't like to wait and she said she would be back in touch. After waiting a week I asked them to cancel the order because I could order them from another site. I was wanting these before I shared the dining room reveal with the new hutch. For some reason it took two weeks to get my order cancelled and to get my refund before I could order them from the other site. So this is six weeks or so later just to get my refund from the first order. You see I have been wanting some old French candlesticks forever, but they are very expensive. This pair from 1st Dibbs for example are for sale for the hefty price of $1495. I don't know about you, but I don't pay that for candlesticks. The candlesticks from Aidan Gray have the look I wanted at a much lower price, but they still aren't cheap by any means. I ordered these from Wayfair and it said they would ship in less than three to five days, but it was a bit longer than that. It thought I'm not going through this again so I tried to cancel them and they said I couldn't because it was a custom order. Say what? So the waiting game was on again. I thought they'd never come, but they finally arrived last week and were worth the long wait. These are my other new pillows that I mentioned in this post that were meant for the sunroom. Well, good thing they work well in the dining room for a spring look. They work well with the buffalo checked curtains. Just remember there are good reproductions out there for a lot less if you're on the hunt for something that may be a bit too expensive or absolutely too expensive. My 84 year young mom is in the hospital as of Saturday afternoon with a hairline fractured pelvis. She is not in her normal hospital since she was in a different area when the accident happened. I'm hoping she won't need surgery, but at her age she may. She will not have it at the hospital she is in if she does need it. Praying we can get her moved to a better hospital soon. Talked to my mom and no surgery needed! Bless her heart! I hope you can have her moved soon and that she doesn't require surgery!! As for the candlesticks, I see many who use candlesticks - but no candles??? I guess this is a trend that I don't understand LOL. This post made me think of my MIL (79) who has absolutely no patience at all! Thanks, Tina. She was moved today. I am so sorry to hear about your Mom! Sending healing thoughts. Love your candlesticks. Love those candlesticks!! I can't believe you had to wait so long for them. I'll have to be wary of that if I ever order those. They look great in your dining room. Yes, I will think twice before ordering again. Sending prayers of healing for your Mom. Glad there is no surgery needed!! Kim, I am so sorry about your Mom...sending prayers! Love the candle sticks! Your dining room looks great. Yes, true French items are pricey. Sadly. Ha ha. Best of luck with your mother. mine is 85 and I am always cautioning her about this and that. Good news about your Mom. Love the candlesticks! 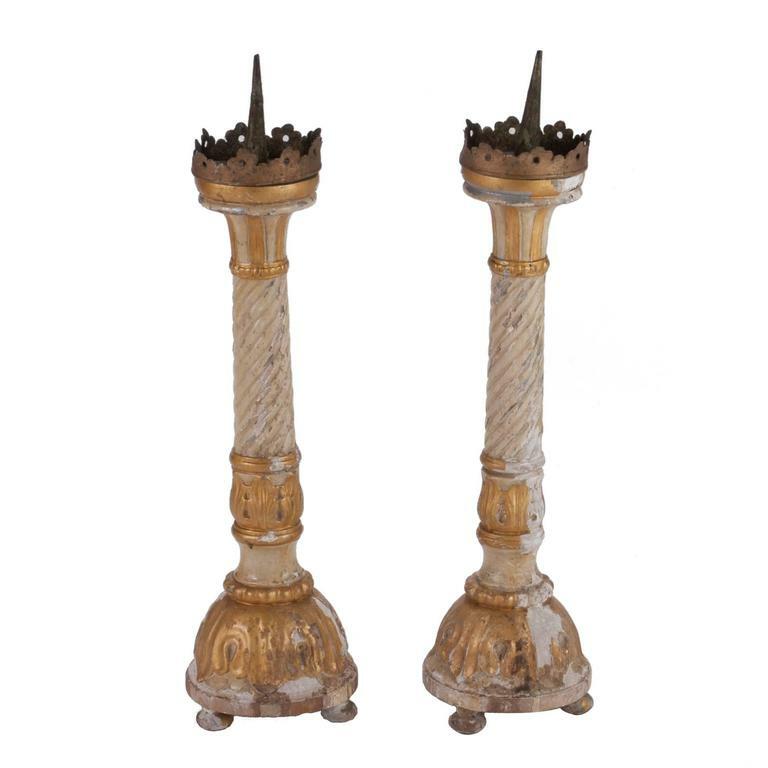 The antique French altar sticks can fetch some crazy prices indeed! Praying for your sweet mama! I have those candle sticks Kim and I have always enjoyed them. I hope you love yours as much as I love mine! So sorry to hear about your mom. I know what you are going through. My mom broke her hip too but she was 91. Praying all goes well. So glad that the candlesticks were worth the wait! They are beautiful! Thoughts and prayers are with your mom for a successful and complete recovery! I am so sorry about your mother. Prayers will be added to my list for a speedy recovery. I love the candle sticks and you are so right about finding less expensive ones. They look so good on your table with your lovely pillows. Those are beautiful and yes not cheap. Back when I had my shop I thought about carrying them but even their wholesale prices are not cheap. So glad your mama will not need surgery Kim! I will say a prayer that your Mom's pelvis heals quickly. Hopefully she will be home soon and back to normal. It is so hard watching our parents get older, I know. Now I am the one getting older:):) LOVE the candlesticks!!! What a wait though! Good grief, I am impatient too. Will you add candles? Thank you, Pinky. No, I probably won't add candles. This is how they are displayed. I am glad to hear no surgery for your mom, and hope she recovers quickly. Your candlesticks add more great French style to your dining room. Like Pamela, I have been looking for some French-style candlesticks to carry in my shop that are reasonably priced. I found some last week at the Dallas Market Center Spring show, but in a different style than yours. Oh- Those candlesticks are gorgeous!! and worth the wait.....and they are terribly pricey. I am glad your mom does not need surgery. That would have been a nightmare trying to get her moved from one hospital to another. There are all kinds of hoops to jump through when you do that. Pretty candlesticks...I am a big fan of Aiden Grey, just bought two lamps I love, shipping took a long time and right now I have one base and two shades, hope the other base comes soon. Sorry to hear of family health issues, that always is stressful, wishing you all well being. Glad I read the post with the update on your mom - that's great that she doesn't need surgery. Wishing her a speedy recovery. The candlesticks are lovely - lucky that you didn't cancel the order! Love the candlesticks, well worth the wait even though it was frustrating. Also love the cushion, those colours are just perfect for spring. I'm backing up to an earlier comment....no candles on the candlesticks? Just think of them as an architectural accent. Pretty candlesticks! Glad your mom didn't have to have surgery. Kim. I am twenty five years younger than your mom and I had a bike accident three years ago and broke my pelvis. The doc said it's the worse pain you can have. I didn't argue!!! After four days in the hospital, I was transported by ambulance to a nursing/rehab facility. I could not walk and had no other option. My sweet hubby couldn't help me. Please tell her it will get better soon and they have good meds to help with the awful pain in the meantime . Prayers. Thank you. She has been moved to a rehab facility. I'm sending my hopes and prayers for your mom's speed recovery! Gorgeous dining room, definitely worth the wait! Prayers for your mother! May the fracture heal quickly!! Love your new candle holders! !